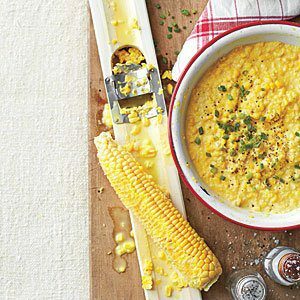 My mother used to make a fabulous creamed corn. The only problem was that we all kept nibbling it while it cooked, and when dinner rolled around there was barely any to go around! I’m going to attempt to restrain myself this time while this dish cooks…. Stir in cream and butter, and cook, stirring occasionally, about 5 minutes or until mixture reaches desired consistency. Stir in salt and pepper. Adjust seasonings to your taste.